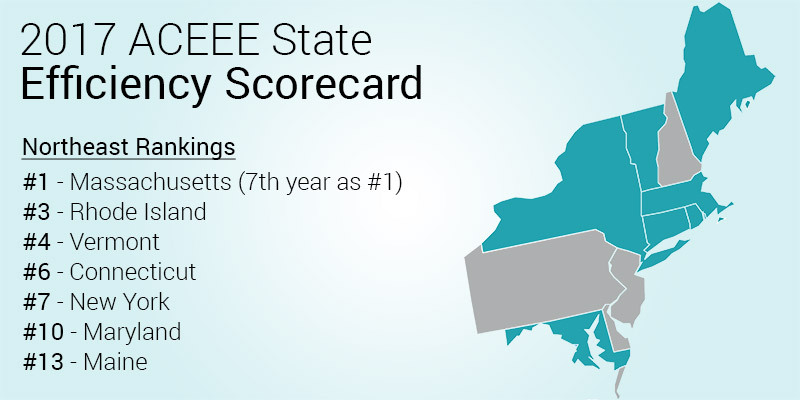 ACEEE released its famous State Energy Efficiency Scorecard last week. The scorecard aims to provide an annual benchmark of state energy efficiency policies and progress, in addition to offering a comparative tool to direct states toward efficiency policies, best practices, and case studies from high-ranking states and regional neighbors. The Northeast and Mid-Atlantic continue to dominate the top 10 rankings, providing a regional example of effective efficiency policies and best practices. Massachusetts secured the top spot for the seventh consecutive year, and five other states claimed over half of the top ten spots. States in the region are performing exceedingly well in the scorecard, no doubt somewhat fueled by their carbon reduction goals. These goals are the most direct approach to reducing carbon emissions at the state level by keeping track of emissions and requiring reductions to specific levels by a certain date. The table below shows the carbon reduction goal for each state. In order to help meet these goals, other state policies and programs helpful to reducing emissions are implemented. These policies and programs include efficiency targets, building energy codes, and public investment funds. In addition, decoupling – separating profits earned by utilities from the volume of electricity generated and sold – is another approach states have adopted to ensure economic viability of the utilities. For those aspiring to get to the top of the heap, there is a lot to learn from the seven-time champion. Massachusetts offers a solid case study in leadership on energy efficiency. The state’s energy efficiency resource standard (EERS) drove savings to three percent in 2016. The EERS includes an average incremental savings of 2.93 percent of electric sales for 2016-2018, which the state exceeded in its first year. The standard calls for all cost-effective efficiency, and with utility revenues decoupled from sales – and performance incentives in place to encourage program administrators to meet or exceed energy savings targets - it’s not surprising to see the goal already surpassed. The Green Communities Act of 2008 has been a key factor in MA’s continuous ranking in the number one spot. This Act established a strong policy framework that prioritizes efficiency over increases in supply capacity. Policy objectives, such as securing energy efficiency resources that are cost-effective and less expensive than supply options, have expanded investment in energy efficiency measures. Energy efficiency resources are sought after before opting for more expensive generation resources that can be purchased. Massachusetts has also exhibited strong support and coordination of low-income energy efficiency services though the state’s Low-Income Energy Affordability Network (LEAN) program. This program coordinates the administration of government- and utility-funded energy efficiency services to income-qualified customers. ACEEE cited this program as one of the most successful of its kind in the country. In 2017, LEAN will oversee the delivery of approximately $120 million in ratepayer and federal funds for low-income weatherization and energy efficiency programs, at no cost to the client. The Baker administration is dedicated to reducing the energy burden on low and moderate income residents throughout the Commonwealth. Although the scorecard just came out, states are already looking ahead to next year’s ranking. Massachusetts is looking for ways to keep atop the pack and other states are exploring what can be done to improve their standing. All of the states in the NEEP region appear in the top half of the scoring, and all have strong EERS policies. Yet, no one scored a perfect 50. There is still room for improvement, and states in our region are always striving to expand the reach and effectiveness of energy efficiency policies and programs. Appliance standards are a major opportunity for all states. 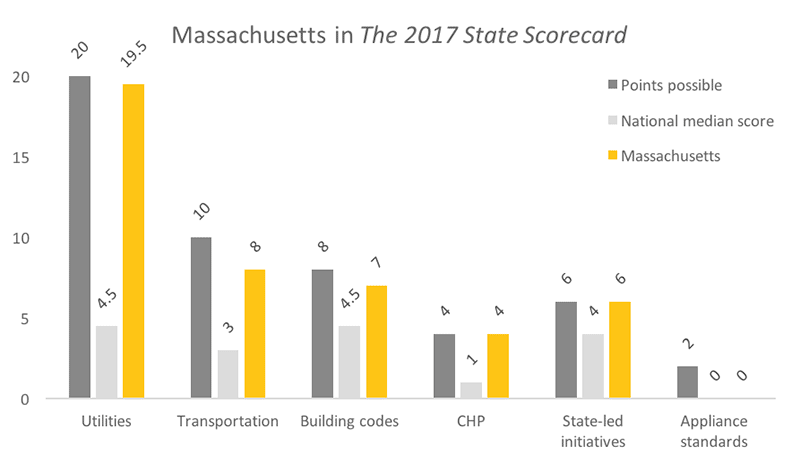 As the top scoring state, Massachusetts received zero points in this category. This is an important area since appliance standards efforts are shifting back to the state level. Based on current work in our states, we expect to see a shift in scoring in this area next year. For instance, Vermont passed an appliance standards bill during the 2017 legislative session that backstops federal residential and C&I appliance standards if repealed and backstops the general service lighting standards. The Appliance Standards Awareness Project (ASAP) has highlighted the savings potential for each state if state standards are adopted. Building energy disclosure is another area where there is potential for states to earn more points by adopting the 2018 IECC building code. Building energy disclosure helps to identify areas for energy efficiency improvements in the built environment. Building codes, on the other hand, help establish a building’s quality, safety, and energy performance for years to come. The initial design and construction decisions determine operational and maintenance costs for the life of the building. Together, benchmarking energy usage and adopting a stringent building code, help improve the efficiency of existing and new buildings. Two states that are currently looking to implement whole building data aggregation thresholds for building energy disclosure include New York and Rhode Island. By implementing progressive thresholds, states can develop a better understanding of energy consumption and areas with higher usage can be targeted for energy efficiency improvement. By addressing appliance standards and building codes and energy disclosure, states can improve efficiency of products and the built environment. Together, this will significantly increase energy savings. By implementing an EERS, states are incentivized to make improvements in the areas where it may not have achieved full points. One state that is ramping up is New Hampshire. In August 2016, the New Hampshire Public Utility Commission issued an order establishing an EERS. The order includes funding savings at 1.3 percent of retail sales by 2020. As part of the standard, utilities have agreed to reduced utility performance incentives paired with a lost-revenue adjustment mechanism (LRAM) and commitment to decoupling for each utility upon filing of its next rate case. We expect to see a lot of improvement in New Hampshire’s standing from the implementation of this standard because performance incentives, decoupling utility revenues, and EERS are all major contributing factors that can help states move ahead. While 2017 remains a transition year with savings targets remaining relatively stable, program administrators are contemplating whether to include demand reduction induced pricing effect (DRIPE) and non-energy impacts (NEIs) within their cost effectiveness screening test. To assist in that decision-making process, NEEP provided NH with technical assistance and a report on cost-effectiveness tests used across the country and different types of NEIs valued by different jurisdiction. With the EERS taking effect in 2018, we expect to NH jump in the rankings over the next couple of years. In Maryland, the legislature passed the EmPOWER bill, which codifies the state’s two percent target of electric energy savings until 2024. Under this program, customers are charged a fee on utility bills. Utility companies use these fees for energy efficiency programs such as home energy check-ups, rebates, and bill credits for reducing electricity use and efficient appliances. New Jersey, currently ranked at 23, has recently introduced legislation that would implement an EERS. The bill, S 3182, states an “electric [and gas] energy efficiency portfolio standard that may require each electric public utility to implement energy efficiency measures that reduce electricity usage in the state by 2020 to a level that is 20 percent below the usage projected by the board in the absence of such a standard.” This would be the first EERS policy for the state. Connecticut released the 2017 draft Comprehensive Energy Strategy, which highlights strategies to improve energy efficiency across the state. Upon implementation, this strategy could set Connecticut apart from other states in the region and pump them up in the rankings. The strategy highlights the opportunity to explore and promote innovative financing mechanisms to leverage private capital and lower upfront costs. This, coincident with non-energy motivators for energy efficiency, will establish a comprehensive framework for encouraging participation in energy efficiency programs. ACEEE has identified various strategies for improving energy efficiency that will help states ramp up their investment in energy efficiency. Such strategies include adopting an EERS or similar energy savings target, such as what was done in Massachusetts or Rhode Island, or working with utilities and regulators to recognize the NEIs of energy efficiency programs. States can also adopt policies moving towards clean transportation, the Massachusetts “make ready” program proposal is an excellent example for electric vehicles.